Let there be no dispute, Ireland are the kings of Europe after an unforgettable St Patrick’s Day in London. For the third time in their history, they are Grand Slam champions of this old tournament and they delivered it in stunning style at Twickenham. 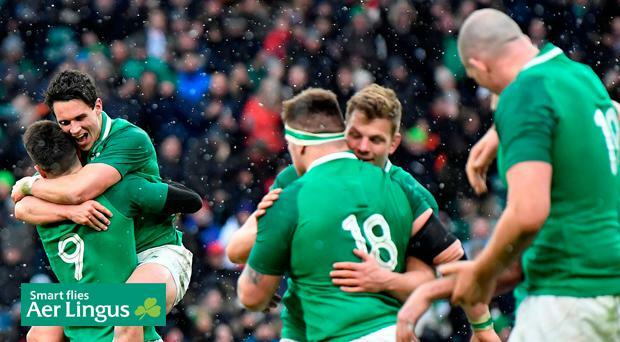 As the snow fell, the green machine were ruthless as they built a 21-5 half-time lead – striking early through Garry Ringrose and then forcing England to chase the game as CJ Stander and Jacob Stockdale added tries before the break. They endured plenty of pressure as you’d expect to do in Twickenham, but they managed the game beautifully despite losing Bundee Aki, Keith Earls and Johnny Sexton to injury during the second-half and Peter O’Mahony to a first-half yellow card. Stockdale's try on the cusp of half-time was the definitive score, giving the hosts a lead that was just too big to chase down. They dominated possession after half-time, but could only muster the one Elliot Daly try as the defence held firm until it was breached at the last when it was too late to matter. It never felt comfortable, it was always absorbing and England kept playing until the death but Ireland were already celebrating as Owen Farrell attempted to convert Jonny May's consolation try after the clock went red. That meant it wasn't a record victory at Twickenham, but no one cared. To win it here was special. Ireland started like a train and never let up. After absorbing some early pressure, Ireland were handed their first invitation to attack when Farrell was harshly adjudged to have tackled Rob Kearney late. Sexton put the ball up in the air from the lineout, Kearney’s pressure forced Anthony Watson into spilling the ball and Garry Ringrose pounced to touch down. England can legitimately claim that the Ireland full-back knocked the ball on, but the Television Match Official was non-plussed. Sexton nailed the conversion, but Ireland found themselves under the cosh again after Earls went off his feet and Farrell kicked to the corner. England’s maul set-up looked good initially, but a combination of James Ryan, Dan Leavy and Rory Best got in on the ball and forced the scrum Ireland’s way. Things were already going against England, Maro Itoje gave away a silly penalty, their lineout wouldn’t step off the mark and referee Angus Gardner gave Ireland a free-kick and when Farrell tried to clear his lines the ball came back off James Haskell’s head. That gave Ireland a scrum in the home side’s territory and they patiently built through 18 phases before Bundee Aki spilled Kearney’s pass. Sexton should have extended his side’s lead when Kyle Sinckler went off his feet in front of the posts, but the out-half’s kick struck the right post. They got their score from the lineout after England had cleared, however, as a Joe Schmidt power-play saw Tadhg Furlong put Aki through a big gap and the centre found Stander on his shoulder and the No 8 wasn’t going to be stopped. Sexton converted and Ireland led 14-0 but Elliot Daly won the restart and Ireland were on the back-foot. They were coping and thought they’d won a turnover, but Aki’s high shot on the winger handed Farrell a chance to go to the corner and he was very lucky not to spend at least 10 minutes on the sideline. England’s first maul was halted, but Ireland were guilty of hitting a lifter early and the home side got another chance. Their maul came up short, Ringrose ripped possession from an English grasp but Richard Wigglesworth regained possession and Iain Henderson gave away another penalty. Again, they went to the corner and this time Gardner lost patience with Ireland and sent Peter O’Mahony to the sin-bin. Ireland were on the rack, but Dylan Hartley let them off the hook by over-throwing the lineout. They got some brief respite, but England did find a gap in the defence and Keith Earls needed to be sharp to deny Watson, but the pressure finally told as Farrell chipped in behind the Irish line for Daly to touch down. Watson never got up from the Earls contact and needed to come off and Farrell couldn’t convert the try. Ireland lost Sexton to a head injury assessment, but Joey Carbery managed the clock well as Ireland wound down the sin-bin by keeping possession. And just as they did against Italy, Wales and Scotland, Ireland struck on the stroke of half-time as Stockdale broke the record for tries in a single Six Nations by brilliantly pouncing after he had kneed his own chip ahead. Carbery made it 21-5 from the touchline and Sexton came back on for the restart. Ireland spent the start of the half defending and needed a brilliant Earls tap-tackle to deny Daly as the covering Kearney cleverly forced the winger into touch. Still, England came and Ireland had to endure 15 odd phases before Daly was penalised for a neck-roll on Kearney and Sexton cleared. Another wave came, but Chris Robshaw knocked on. The home side were being roared on from the stands, but they were lacking inspiration on the pitch and their attacking play was all-too predictable. Ireland forced a penalty from the resultant scrum to relieve the pressure but a truck-and-trailer penalty spoiled the opportunity. They lost Aki to a serious injury, meaning Jordan Larmour played half an hour in midfield. He almost scored with his first touch but was hauled down just short by Daly, but more poor English discipline allowed Conor Murray extend Ireland’s lead to 24-5 with a quarter of the game remaining as he took over the kicking duties from Sexton. A Dan Leavy knock-on handed the home side another opportunity, but Earls snuffed it out as he beat Daly to Farrell’s chip in behind. They finally closed the gap with a try of real quality as O’Mahony was penalised for holding on and England attacked from the lineout. Mike Brown worked his hands free in Earls’ tackle and his brilliant offload handed Daly his second try. Again, Farrell’s conversion was off target so Ireland had a 14 point lead to protect. A chance to extend it came and went as Stockdale was forced into touch and another silly penalty, this time from Joe Marler, handed Carbery a chance to make it a three-score game but his kick drifted wide. A brilliant Ringrose rip halted Daly’s march as England briefly threatened and Gardner wrongly handed Ireland a scrum for good measure as the clock slowly ticked towards 80. A brilliant Sean Cronin tackle denied Brown in the corner with less than three minutes to go and although they were limping towards the line, Ireland were approaching the stage where they couldn’t be caught. England kept playing until deep into injury time, looking for a consolation try, and got it through Jonny May, but it was too late to spoil Ireland's Grand Slam party. ENGLAND – A Watson (M Brown 33); J May, J Joseph (G Ford 56), B Te’o, E Daly; O Farrell, R Wigglesworth (D Care 61); M Vunipola (J Marler 53), D Hartley (capt) (J George 58), K Sinckler (D Cole 53); M Itoje, G Kruis (J Launchbury71); C Robshaw, J Haskell, S Simmonds (S Simmonds 62). IRELAND –R Kearney; K Earls (K Marmion 74), G Ringrose, B Aki (J Larmour 56), J Stockdale; J Sexton (J Carbery 33-40, 67), C Murray; C Healy (J McGrath 51), R Best (capt) (S Cronin 65), T Furlong (A Porter 65); J Ryan (D Toner 67), I Henderson; P O’Mahony (J Murphy 74), D Leavy, CJ Stander. Ref – A Gardner (Australia).